and the explanation in kibitz#6 just below. 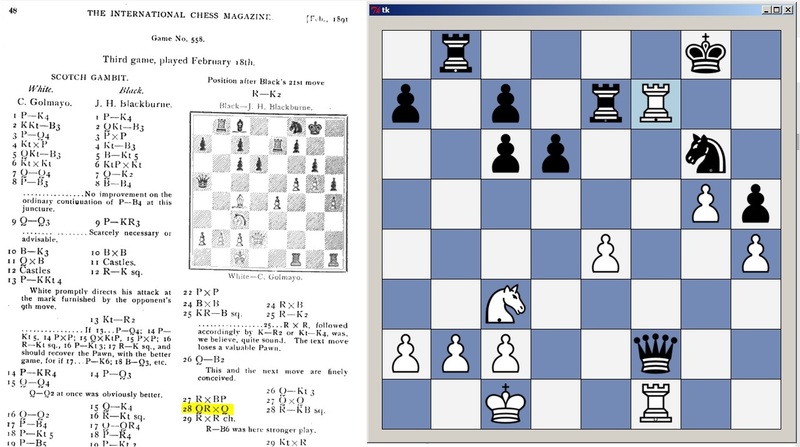 Here’s a screenshot from Steinitz’s International Chess Magazine, v7, Feb 1891 p48, showing the ambiguous descriptive notation at White’s move 28 (well, ambiguous if the piece’s don’t denote QR vs KR and the reader wasn’t careful tracking each piece during play). The replay window is my new program, with the Q-side vs. K-side pieces differentiated. The rook on f7, highlight-ready to move, has the little black dot on its base, denoting it as the QR. Easy to spot when needed. Which is probably why Steinitz, playing on such a set, never realized the difficulties his notation might cause some hundred+ years later. I’ve got a fully functioning version of the program now, which allows the entire game to be input, fully and correctly (i.e. 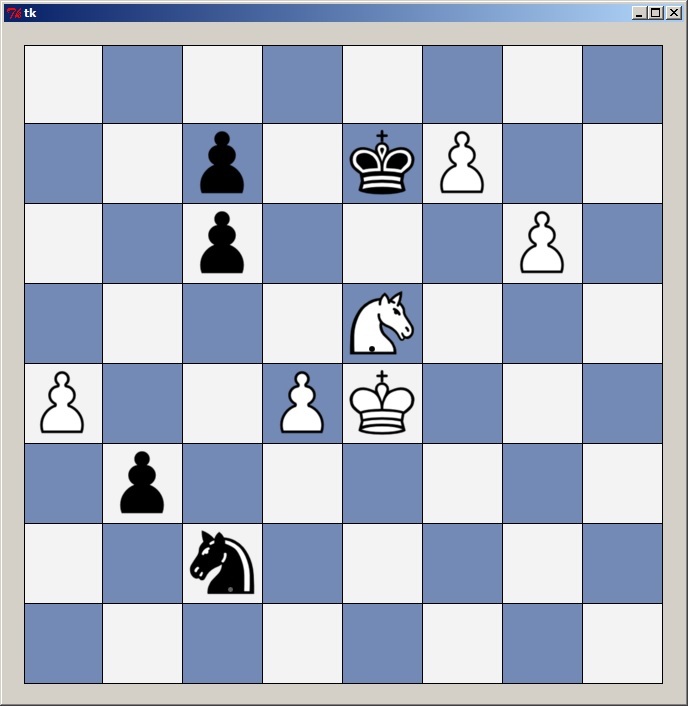 castling, e.p., promotion all handled properly). The mousewheel can be used to scroll move-by-move forwards/backwards in the game. The pieces get moved via the click-click method, as I haven’t done drag-and-down (yet(?)). I’ve edited the PGN tags and result to match the game, as the program just prints out defaults (yes, it’s not too smart, or rather, user-friendly). 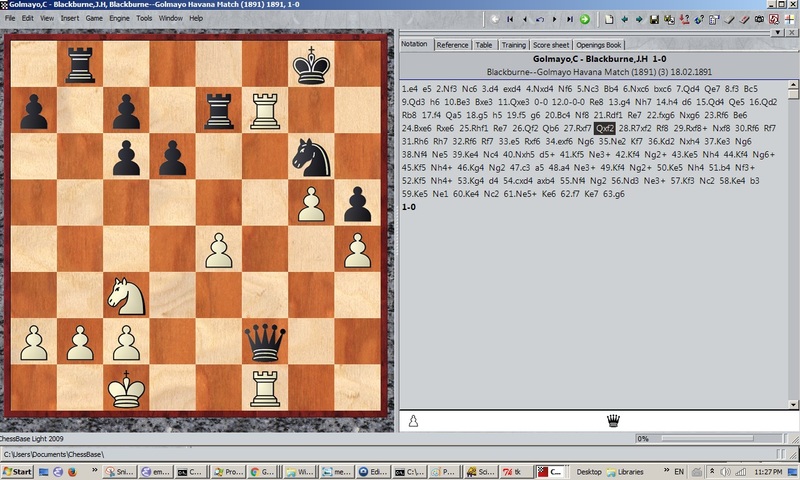 Still, one can just cut-and-paste the above into SCID, or Chessbase, and have a correct version of the game (and with normal PGN transcribed). At this point the program is pretty serviceable, though quite rough around the edges. Let’s see it I work on it more (maybe- as a tactical trainer/opening book trainer). I would have preferred modifying SCID, but assuming the K-side/Q-side pieces are the same is a very fundamental design decision, baked in quite early I assume.